Aesthete playwright Oscar Wilde, the Victorian era’s renegade son was among the social elite of the Gilded Age who frequented New York’s NoMad neighborhood in the late 1800s. 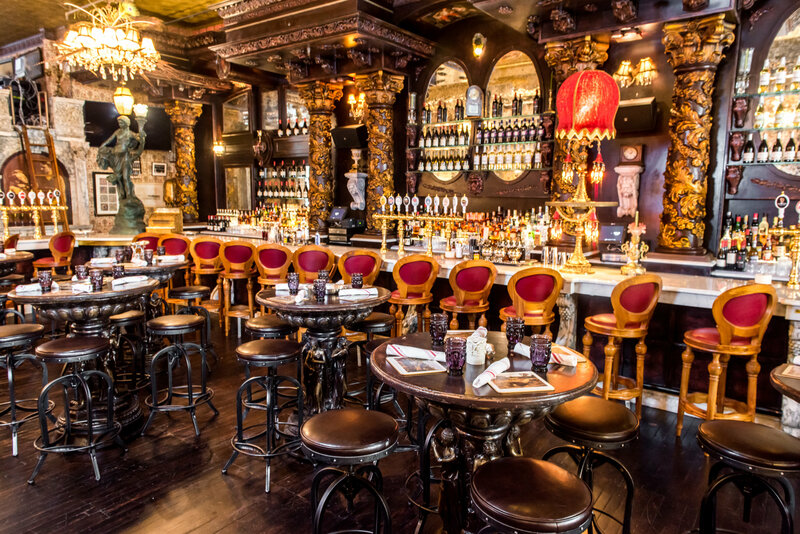 Today, his memory is preserved and celebrated at his namesake bar, offering visitors a sophisticated Victorian social experience in the same neighborhood where Wilde once stayed. The proprietors have spared no detail or expense in paying homage to the author of famed works, including the perennial favorites: The Picture of Dorian Gray and The Importance of Being Earnest. In doing so, they have created an atmosphere brimming with nostalgia, style and a bit of naughty sophistication. There is a sprawling 118.5-foot bar (the longest in NYC), a plethora of antiques that fill the space, and thoughtfully crafted cocktails with names like “Writer’s Block” and “Lady Speranza” (named after Wilde’s mother). Even the site of the bar itself has historic significance: The building was once the headquarters for the Prohibition Enforcement Bureau, and it is believed the mob occupied one of the upper floors to spy on bureau activities. All in all, it is just the kind of place Wilde himself might have enjoyed. Numerous statues throughout, including one of the author himself. Even the restrooms offer interesting diversions. The men’s room is designed after Castle Leslein where Paul McCartney was married—except, perhaps, for the urinals, which are irreverently named “LIAR” and “LARGER.” A live talk radio broadcast from Hope Castle is piped into the women’s room. Of course, people don’t go to bars just for the décor—they come to indulge. The Oscar Wilde offers a varied menu of small plates, hearty burgers, lush salads and satisfying entrees like Steak Frites and Faroe Islands Salmon. Additionally, the bar menu is comprised of 300 spirits, nearly three dozen tap beers, and cocktails modestly priced at $14. Oscar Wilde is a great place to enjoy a meal, have drinks with friends after work, or enjoy a bit of nostalgia. It is a “must see” for tourists and locals alike. Monday – Sunday: 11:30 a.m. – 2:00 a.m.